Gov Kashim Shettima of Borno on Friday donated a two-bedroom flat to a nursing Internally Displaced Person (IDP), Halima Algoni. Algoni lost her husband and parents in an attack by the Boko Haram at Bulabulin Ngaura, Damboa Local Government Area in 2015. NAN also reports that the donation was in fulfilment of Gov. Shettima`s promise to Amina in January, after she had narrated her ordeal in the hands of the Boko Haram insurgents. The IDP was spotted by Gov. Shettima during a presentation of relief materials donated by a Kano-based group of Ulamas at the El-Miskin IDPs centre, Maiduguri in January. Hajiya Fanta Baba Shehu, the Commissioner for Women Affairs and Social Development, presented the keys to the house to Algoni on behalf of the governor. Baba Shehu said the gesture was aimed at alleviating the sufferings of the IDP who lost virtually all she had with no one to cater for her livelihood. ‘‘We are glad to know that Halima had given birth to a bouncing baby boy named Muhammad Kadu. ‘‘This house is donated to her by Governor Kashim Shettima, the key and all the document of the house are hereby given to her,’’ she said. In her remarks, Algoni thanked Gov. Shettima for fulfilling the promise he earlier made to her. 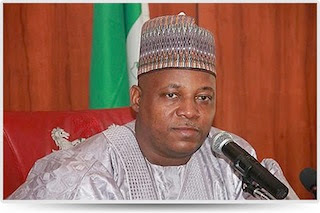 ‘‘May Allah give Kashim Shettima the keys to Jannah (Paradise), ” she prayed.